Help spread the word by plugging into our various channels using this quick how and where to post guide. We are always on the look out for complementary media and industry association partners to help raise the awareness of IoT Slam and our associated initiatives. If you would like to collaborate with the Internet of Things Community and be considered as a media partner to benefit from our exclusive affiliate scheme please drop us a line at info@iotslam.com and one of our team will be in touch. Founded in 2007, the Healthcare Executives Network is the largest of its kind. We strive to be a responsible advocate in thought leadership and professional development for healthcare executives worldwide. With over 200,000 members, the Healthcare Executives Network is the #1 networking and thought leadership organization for healthcare executives and their strategic partners. Learn more at www.HealthcareExecutivesNetwork.org. ReadWrite is the leading media platform dedicated to IoT and the Connected World. In 2015, Forbes named ReadWrite one of the top 100 websites for entrepreneurs. SIMalliance is the global, non-profit industry association which simplifies secure element (SE) implementation to drive the creation, deployment and management of secure mobile services. SIMalliance promotes the essential role of the SE in delivering secure mobile applications and services across all devices that can access wireless networks. By identifying and addressing SE-related technical issues, and both clarifying and recommending existing technical standards relevant to SE implementation, the SIMalliance aims to promote an open SE ecosystem to facilitate and accelerate delivery of secure mobile applications globally. Tractica is a market intelligence firm that focuses on human interaction with technology. The company’s market research and consulting services provide industry participants and stakeholders with in-depth analysis of emerging technology trends, business issues, market drivers, and end-user demand dynamics across multiple application domains including home, mobile, health, automotive, enterprise, and industrial markets. Tractica’s global market coverage combines qualitative and quantitative research methodologies to provide a comprehensive view of the emerging market opportunities surrounding User Interface Technologies, Biometrics, Digital Health, Wearable Devices, and Automation & Robotics. WITI’s mission is to empower women worldwide to achieve unimagined possibilities and transformations through technology, leadership and economic prosperity. With a global network of smart, talented women and a market reach exceeding 2 million, WITI has powerful programs and partnerships that provide connections, resources, opportunities and a supportive environment of women committed to helping each other. Along with its professional association of Networks throughout the U.S. and worldwide, including Hong Kong, Great Britain, Australia, and Mexico, WITI delivers value for individuals that work for a company, the government or academia, as well as small business owners. WITI products and services include: Networking, WITI Marketplace, Career Services/Search, National Conferences and Regional Events, Publications and Resources, Small Business Programs, Research, Bulletin Boards and more. The Social Media Portal (SMP) is a global news and information directory. Showcasing social media and related technology its free resources benefits academics, analysts, advertisers, businesses, marketers, PRs, researchers etc. AAdd your apps, blogs, press releases, campaigns, research, events and more for free. Keep up-to-date @smponline. Elemental is a communications consultancy that simplifies global communications between brands and stakeholders. Elemental is a proven global content marketing, media relations, PR and social media specialist – integrating data, creativity and marketing. Learn more at Elemental and @elementalcomms for how we can sustain relevant visibility for your brand. RAIN RFID is a wireless technology that connects billions of everyday items to the internet, enabling businesses and consumers to identify, locate, authenticate, and engage each item. RAIN technology is based on a UHF RFID protocol standard developed by GS1 and ISO. Hundreds of companies have delivered products using these standards worldwide since the 1990’s, starting with the initial creation of the Internet of Things (IoT). A RAIN RFID tag was named the Internet of Things 2015 Product of the Year at the Embedded Systems Conference ACE Awards. Over 20 billion RAIN RFID tags have been deployed to date, with over 6 billion in 2015, and industry analysts expect the market to grow at ~28% annually through 2018. The RAIN RFID Alliance was founded in April 2014 by Google, Intel, Impinj and Smartrac; and supported by AIM. The RAIN Alliance is a global organization promoting the universal adoption of RAIN technology solutions across many different vertical markets. There are now over 80 members worldwide, and the alliance is growing steadily. Learn more at www.RAINRFID.org. As the consumer ecosystem is skyrocketing, join Robin Thurston (UnderArmour) & Greg Orr (Walgreens) in their discussion of how these new partnerships can promote big changes in the healthcare system. We will also examine the evolutions of a smarter health care system with the help of Jon White (ONC) & Andy Krackov (CHCF). Subscribe to our newsletter to learn more! The IoT Global Network is a new platform for the IoT community. It is a destination where you can connect with industry experts and network across the IoT community to build the successful IoT business of the future. The site has a database of over 600 companies and products profiled on the site and this is growing daily. UPnP Forum is a global alliance of more than 1,000 industry-leading organizations working to enable device-to-device interoperability and facilitate easier and better networking in the home and beyond. The Forum promotes the adoption of uniform technical device interconnectivity standards and certifies devices conforming to these standards. UPnP Forum is an impartial group enabling member companies to participate and develop extensions to the UPnP Device Architecture, which defines how to use the Internet Protocol (IP) to communicate between devices, and Device Control Protocols (DCPs), which are services between devices. Members of UPnP Forum include market leaders in computing, printing and networking, consumer electronics, home appliances, automation, control and security, and mobile products. oneM2M is the global standards initiative that covers requirements, architecture, API specifications, security solutions and interoperability for Machine-to-Machine and IoT technologies. oneM2M was formed in 2012 and consists of eight of the world’s preeminent standards development organizations: ARIB (Japan), ATIS (N. America), CCSA (China), ETSI (Europe), TIA (N. America), TSDSI (India), TTA (Korea), and TTC (Japan), together with six industry fora or consortia (Broadband Forum, Continua Alliance, GlobalPlatform, HGI, Next Generation M2M Consortium, OMA) and over 200 member organizations. oneM2M specifications provide a framework to support applications and services such as the smart grid, connected car, home automation, public safety, and health. oneM2M actively encourages industry associations and forums with specific application requirements to participate in oneM2M, in order to ensure that the solutions developed support their specific needs. For more information, including how to join and participate in oneM2M, see: www.onem2m.org. The IPSO Alliance is a global forum comprised of a diverse international membership of companies and non-profit organizations focused on developing the definition of a smart object framework with an emphasis on the aspects of identity and privacy. IPSO Alliance membership is open to any organization supporting an IP-based approach to connecting smart objects. For more information, http://www.ipso-alliance.org/. Fully independent, IoT Business News is the reference news sources for all Internet of Things and Machine-to-Machine business professionals across the world. Served by a responsive team, IoT Business News publishes every day, fresh, relevant and reliable news on the M2M and IoT markets, all in a clear and illustrated way. 100% focused on the business side of the Internet of Things, we only select the news that really matter and we give the voice to industry experts from the top IoT companies. Our popular IoT events calendar lists the best IoT events to attend along the year as well as it shares the discount codes we could possibly get for our readers. And thanks to our free e.newsletter, our business subscribers receive twice a month, right in their email box, the top IoT news of the month and our selection of M2M and IoT trade shows! Z-Wave® technology is an open internationally recognized ITU standard (G.9959). It is the leading wireless home control technology in the market today, with over 1500 certified interoperable products worldwide. Represented by the Z-Wave Alliance, and supported by more than 375 companies around the world, the standard is a key enabler of smart living solutions for home safety and security, energy, hospitality, office and light commercial applications. Z-Wave® is a registered trademark of Sigma Designs (NASDQ SIGM) and its subsidiaries in the United States and other countries. About Embedded Computing Design: Engineers and developers have different needs based on a variety of factors, which include geography, generation, or most important, which segment of the design cycle they are operating in. Embedded Computing Design understands the design engineer/developer and those needs. Hence, we provide the necessary and pertinent information how, when, and where it’s most useful. We segment the majority our coverage into the following categories: industrial, automotive, consumer; and medical/healthcare. And the overriding technologies that are prevalent in everything we cover include IoT, security, AI/machine learning, and analog/power. How do I register for a media pass? 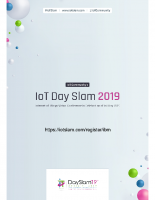 Here you will find pertinent information for journalists, bloggers and associated media channels wishing to attend and or partner with IoT Slam Live 2019. If you have any further questions, please send us a mail to info@iotslam.com Media passes are complimentary – subject to media credential verification. If you would like to register to attend the even as a member of the media community, please send us a mail to media@iotslam.com confirming your interest and we will get back to you. We will accept proof of an affiliation with a nationally or regionally recognized media outlet and/or proof you hold an editorial job title and/or evidence of your journalistic credentials (for example a copy of your press card, masthead or a by-lined article). Can I contact speakers, sponsors, and exhibitors before the event? Yes, once you have registered for a media pass and your participation has been confirmed by our team, you will be added to our Online Networking System prior to the start of the event, which will enable you to contact other attendees. This feature will be available approximately 2-3 weeks before the event and we will contact you by email to let you know when it is live.